Payment Methods : Visa, MasterCard, Maestro, Skrill, Neteller, Bank Transfer. 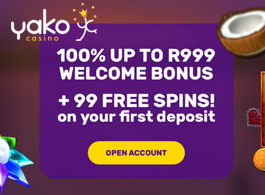 South African players can choose from a plethora of gaming venues available on the market but there are not many of them which will provide you with such a wide selection of casino games like Yako Casino does. Whether you prefer playing casino games from the comfort of your home or on the move, Yako Casino, powered by the platform developed by EveryMatrix and regulated and licensed by the gaming authorities from Malta and Curacao, will offer you a comprehensive selection of slot machines, table and card games, Video Poker and live casino games. The gaming content is available in South African Rand which is supported for all transactions and wagers. The platform powered by EveryMatrix combines the gaming products supplied by a variety of software developers such as NetEnt, NYX Gaming, Thunderkick, Quickspin and others providing players with multiple betting options. All the games are accessible directly on the gambling site in instant-play mode with no additional software needed and they perform smoothly. However, sometimes you may experience that the loading of pages takes a bit longer, so you have to be patient. With the games provided by some of the leading companies in the gaming industry you will enjoy exquisite visuals and sounds whether you play them on your desktop or mobile device. If you prefer mobile gaming, you can easily launch the casino on your mobile browser and access the games without downloading the content. The outcome of the games is determined by the Random Number Generator which is governed by the licensing agreement, which means that the casino meets the high industry standards in terms of the fairness of gameplay. There are more than 900 casino games to choose from once you join Yako Casino Mobile. Provided by a more than 15 software developers, the games include all types of slot machines, table and card games, Video Poker variations and live dealer tables. A full range of games is available on the mobile platform too but there are not as many games as in the online casino. New releases are added on a regular basis, so you can rest assured that you won't miss any new title going live. Whether you are a beginner or a high-roller, you will easily find an affordable game to your liking. The games are organised in sections with classic and video slots under the Slots section and progressive slot machines under the Jackpots section. Some of the most popular titles include Starburst, Mega Fortune, Foxin' Wins and Book of Dead. Players who are into table and card games can choose from dozens of Blackjack, Roulette, Baccarat and Poker variants available at virtual and live tables. Craps, Sic Bo and Video Poker variants like Jacks or Better are offered too. Live dealer tables are provided by one of the most prominent gaming companies Evolution Gaming and they are available on mobile devices. Yako Casino can be accessed from a wide array of handheld devices powered by iOS, Android and Windows. Some of the supported devices are smartphones like iPhone 4S to iPhone 7, Samsung Galaxy models, Google Nexus devices and more. If you want to enjoy the games on larger screens wherever you are, choose any of tablets powered by the listed operating systems. Slot aficionados will be delighted to hear that Yako Casino Mobile offers 10 free spins to all its new customers who create a new account. The free spins are available on one of the most popular NetEnt games Starburst and they are active immediately, so just find the game and enjoy the rounds on the house. Over your first deposit you will be given a 100% match bonus up to R3,333 with 222 free spins on Starburst on top. Wager the bonus amount and winnings obtained from it 25x to be able to turn free cash into real money and clear it from your account. Once you are an existing player, you can make use of recurring offers which may include free spins, a 10% cashback on your real money losses and slot challenges. To make your deposits in a safe and convenient way opt for one of the banking methods supported by the gaming venue. The include credit and debit Visa, MasterCard and Maestro cards, Trustly, Bank Transfer, e-wallets like Skrill and Neteller as well as Entropay and PaySafeCard. Depending on the method you choose, transactions may be instantly processed or the procedure may take up to 5 days. All your financial data will be safeguarded by SSL encryption. You can get professional assistance via live chat, email and phone if there is any kind of problem or doubt. However, keep in mind that the support team is not available 24/7. Instead, you can reach them during opening times between 12:00 and 23:00 CEST. South African players looking for a place where they can choose from a plethora of casino games and play them in their national currency need look no further as Yako Mobile Casino offers just what they need. Yako Casino is committed to providing players with a safe and fair gaming experience in a friendly environment and there are attractive bonuses and promotions to boost your bankroll and make your stay at it even more rewarding. Don't forget to visit the casino and give it a try. You will have a chance to enjoy the best of online and mobile gaming for the money wagered.